How many modules are required to complete the program? How long will it take to earn the designation? What will I receive after I complete a module? Do I need to be a member to take the designation modules? No. Our modules are available to anyone and there is no membership requirement for registration. What is the Comprehensive Qualifier? Is it required to be completed before attending the Program? How often is the Leadership Program run throughout the year? 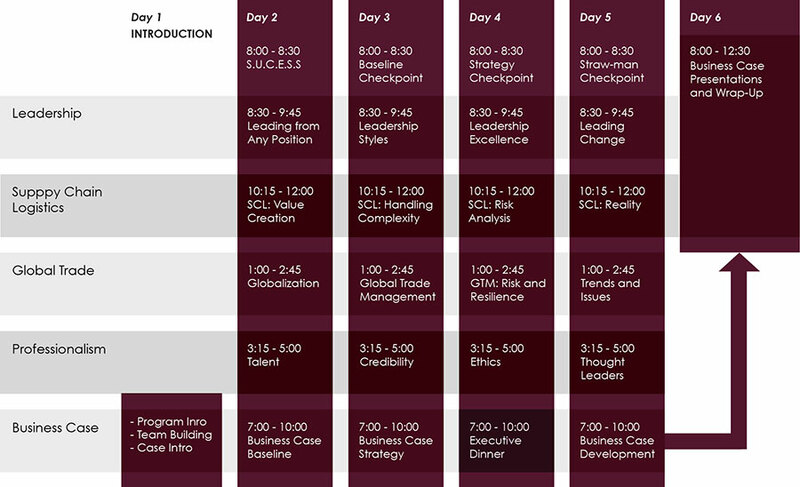 Registration Fees include all accommodations and meals from the evening of Day 1 to lunch on Day 6, including an Executive Dinner on Day 4; all material and facilitation costs; and automatic registration in Q, the online Comprehensive Qualifier from Stanford University. It must be completed before Day 1 of the Leadership Program to ensure you are publicly recognized as a P.Log at the end of the program on Day 6. Between the Process Management and Leadership Programs, would I earn different designations or the same? What is the value of the P.Log? What is the value of the LS? What If I have a college diploma or university level degree in logistics? Can it be used toward the programs? I have worked in the industry for several years, can my experience be used toward any credit to the programs? Continuous Learning: The value of your designation is integrally linked to your professional competence and personal career growth. As a P.Log. you are committed to life-long learning. Career Opportunity Network: Members receive access to our customized Career Network job board which has access to the largest career networks available, holds a comprehensive listing of positions available in logistics and supply chain. This service allows job seekers to post resumes where elite industry professionals are looking. Employers will have access to highly qualified pool of applicants to ease your search. P.Log Member Perks: As part of your P.Log membership, you will receive exclusive access to a member benefits perks package with great opportunities for savings. Each of these opportunities are no cost to you as part of your P.Log membership. Enjoy savings for hotels, office supplies, IT software cost reduction and more. Professional Standards: All members stand by the professional designation as a public statement of competence and integrity, and a commitment to train for the future. As part of a professional Code of Ethics, in accordance to the code members adhere to maintain high personal standards of moral responsibility, character and integrity when acting in my professional capacity.